30 Second Wine Advisor: Popping a ... cap?  Popping a ... cap? As alternative wine-bottle closures gain attention, screw caps and synthetics are cutting into the market share long held by natural cork. Here's an idiosyncratic option: A pry-off beer-bottle cap. GV on the simple side, but it's balanced, interesting and refreshing, and that's a splendid payoff for a bargain-basement price. 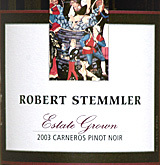  Connoisseurs' Series Two outstanding top-tier red wines from California Wine Club's elite program, available this month for 30 Second Wine Advisor readers: Terre Rouge 2003 "Ascent" Sierra Foothills Syrah and Robert Stemmler 2003 Carneros Pinot Noir. We're sipping Riesling and tasting ripe grapes in new articles this week, and debating whether oak in wine is good or evil on our Internet radio TalkShoe. On our forums, we're talking about White Zinfandel versus dry rosé, and our weekly poll asks whether you'd let your children enjoy wine with meals in your home. As alternative wine-bottle closures gain attention, screw caps and synthetics are cutting into the market share long held by natural cork. In some specific niches, particularly white wines from Australia and New Zealand, it appears that the screw cap - specifically, the heavy-duty, modern Stelvin-brand screw cap and similar competitors - has all but supplanted natural cork; and it's beginning to make inroads in the U.S. and even Europe. Synthetic (plastic) stoppers, similarly, are showing up increasingly in less expensive wines not intended for long-term cellaring. Today, let's take a look at an interesting if a bit downscale closure option - the "crown cap," the pry-off metal cap that's most often seen on beer bottles. Lined on the inside with a translucent (and presumably inert) white plastic substance that forms a seal and prevents direct wine-to-metal contact, it's tightly crimped down but can be easily pried off with a simple beer-bottle opener, the so-called "church key." Although not widely advertised, it's no secret that virtually all Champagnes - even high-end, pricey brands - are held under beer-style crown caps during production. The cap is replaced with the traditional mushroom-shaped Champagne cork only after the wine's secondary fermentation in the bottle is complete. Indeed, one of the first wines sold at retail under crown cap in the U.S. was a modest sparkler, Mionetto's "Il" Prosecco, a wine designed for casual gulping without much pomp or reverence. 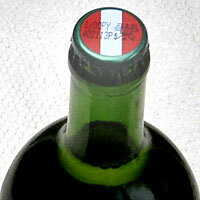 More recently, crown caps have started turning up on simple, inexpensive bottles of Austrian Grüner Veltliner, wines meant to be quaffed while they're young and fresh. For today's tasting, we unholstered the old church key to pop the cap on a 2006 "GV" from H. u. M. Hofer, an all-organic producer in Auersthal, a village just north of Vienna, whose crown-capped offering may just be the best wine buy of the year so far at $10 for a fat one-liter bottle of crisp, citric and minerally dry white wine that's just right for summer sipping or drinking with just about any meal. FOOD MATCH: Versatile and food-friendly, GV finds its match in a wide variety of dishes, with a special facility for freshwater fish and "white meats" from chicken to veal. It's also a go-to wine for Southeast Asian and Pacific Rim cuisine, and went very nicely with a spicy Thai Yum Neua beef salad. VALUE: At $10 for a stubby one-liter bottle, the equivalent of just $7.50 for a standard "fifth," this has to rate as one of the best quality-price-ratio wines of this or any other year. WHEN TO DRINK: GV ages nicely, but there's no particular reason not to slurp up this simple, fresh example this year, while it's young and fresh. Perfectly suited for summer sipping with picnic fare. 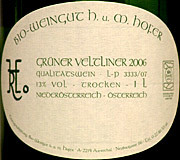 Grüner Veltliner = "Green-er Felt-leen-er"
Here's a fact sheet on the 2006 Hofer GV on the U.S. importer's Website, from where you can also click to a short article about the winery. Another month, another pair of excellent, top-tier wines from California Wine Club's limited-membership Connoisseurs' Series. Every month I look forward to tasting and telling you about these special wine selected by Connoisseurs' Guide publisher Charlie Olken and California Wine Club's Bruce Boring, who pick out a carefully chosen selection of excellent, balanced ultra-premium wines for club members every month. Visit http://www.cawineclub.com/connseries or call The California Wine Club at 1-800-777-4443 to join or learn more about The Connoisseur's Series. Feel free to tell them that I sent you ... and, if you join, please don't hesitate to contact me by E-mail and tell me what you think. When was the last time you tasted a ripe Chardonnay grape, or a Pinot Noir grape? Wine lovers rarely get to taste the grapes that go into our favorite wines. How do wine grapes differ from table grapes?  Our Internet radio "TalkShoe": Oak - good or evil? What is the role of wood in the making of a great wine? We're looking for interesting and informed comments on this controversial subject in our next live TalkShoe, Saturday, June 2, at 1 p.m. US EDT (19:00 in Western Europe).  WineLovers Discussion Group: Good White Zinfandel? White Zinfandel is almost invariably made as a pink, semi-sweet "blush" wine, mostly from mass-market producers. Does anybody make one in the style of a crisp, dry, Provence rosé? And if they did, would it make any sense for them to label it a White Zin? Talk about this topic, and share your recommendations, on our WineLovers Discussion Group.  Netscape/Compuserve Community Poll: May your children taste wine at home?